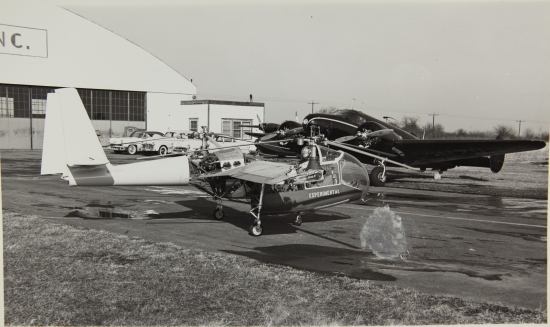 The Transcendental Aircraft Company was formed by former Piasecki workers in 1945 to investigate tilting rotor technology. It built the single-seat open cockpit Model 1-G in 1951. The 1-G suffered from dynamic stability problems that were determined to be fundamental to the tilting rotor concept, so the Air Force funded research on rotors in transition including gyroscopic effects and oblique airflow. The 1-G then made its first flight (as a helicopter) on 6 July 1954 and made its first conversion to horizontal flight that December. A single 160 hp Lycoming O-290-A engine powered three-bladed 17 ft rotors at each wingtip. The piston engine had a manual two-speed reduction box that powered shafts down each wing. At the pivot, three concentric shafts supplied input to the rotors for tilt angle, cyclic pitch, and collective pitch. At the maximum engine speed of 3,000 rpm, rotor speed for hover was 240 rpm, while for horizontal flight they rotated at 633 rpm. The rotors required three minutes to transition through 82° of tilt during conversion, including the gear change. The 1,750 lb (fully loaded) 1-G had a 26 ft long fuselage and a wingspan of 21 ft. The height was only 7 ft; in fact, the 1-G was so small, the pilot's head rose above the windscreen (see photo). The 1-G flew over 100 flights and 20 hours before being lost in an accident on 20 July 1955 due to a rotor control mechanical failure. Top speed was about 160 mph. 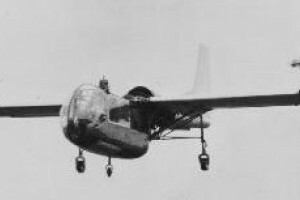 A 4,000 lb Model 2 with a 250 hp engine was tested in 1956-57, but the Air Force decided to not fund it further in order to pursue the competing Bell XV-3. Resources related to the Model 1-G , provided by the Vertical Flight Society. Resources related to the Model 1-G , provided by public sources across the internet.